The Legend of Zelda: Ocarina of Time[a] is an action-adventure game developed and published by Nintendo for the Nintendo 64. It was released in Japan and North America in November 1998, and in Europe, Australia and New Zealand the following month. Ocarina of Time is the fifth game in the Legend of Zelda series, and the first with 3D graphics. Originally developed for the 64DD peripheral, it was instead released on a 256-megabit (32-megabyte) cartridge, the largest-capacity cartridge Nintendo produced at that time. The player controls Link in the fantasy land of Hyrule on a quest to stop the evil Ganondorf, king of the Gerudo tribe, from obtaining the Triforce, a sacred wish-granting relic. He travels through time and navigates dungeons to awaken the Seven Sages, who can seal Ganondorf forever. Ocarina of Time introduced features such as a target-lock system and context-sensitive buttons that have since become common in 3D adventure games. Music plays an important role: to progress, the player must learn to play numerous songs on an ocarina, and the game was reportedly responsible for increased interest in the instrument. In Japan, more than 820,000 copies were sold in 1998, making it the year's tenth-bestselling game. During its lifetime, over a million copies were sold in Japan, with over seven million sold worldwide. The game won numerous awards and accolades and is considered by many to be one of the greatest video games of all time, with numerous publications having ranked it the best video game of all time. It is also the highest-rated game on review aggregator site Metacritic and the second highest-rated on GameRankings, behind Super Mario Galaxy, also made by Nintendo. Ocarina of Time was followed by a direct sequel, The Legend of Zelda: Majora's Mask, in 2000. It was ported to the GameCube alongside Ocarina of Time Master Quest, an alternative version of the game with new puzzles, and was included in The Legend of Zelda: Collector's Edition in 2003. It was ported to the iQue Player in 2003,[not verified in body] and released on the Virtual Console service for the Wii in 2007 and Wii U in 2015. The rereleases were well received, though some critics felt the game had aged badly. A remake for the Nintendo 3DS, Ocarina of Time 3D, was released in 2011 with updated graphics and autostereoscopic 3D effects; it includes Master Quest's rearranged dungeons, absent from the Wii, Wii U, and iQue versions. The on-screen display shows actions mapped to context-sensitive buttons. The Legend of Zelda: Ocarina of Time is a fantasy action-adventure game set in an expansive environment. The player controls series protagonist Link from a third-person perspective in a three-dimensional world. Link primarily fights with a sword and shield, but can also use other weapons such as projectiles, bombs, and magic spells. :22–25 The control scheme introduced techniques such as context-sensitive actions and a targeting system called "Z-targeting",[b] which allows the player to have Link focus and latch onto enemies or other objects. :11–12[c] When using this technique, the camera follows the target and Link constantly faces it. Projectile attacks are automatically directed at the target and do not require manual aiming. Context-sensitive actions allow multiple tasks to be assigned to one button, simplifying the control scheme. The on-screen display shows what will happen when the button is pushed and changes depending on what the character is doing. For example, the same button that causes Link to push a box if he is standing next to it will have him climb on the box if the analog stick is pushed toward it. Much of the game is spent in battle, but some parts require the use of stealth. Exploration is another important aspect of gameplay; the player may notice inaccessible areas and return later to find them explorable after obtaining a new item, such as the bomb, to blast through walls, or the hookshot, to reach distant places. When the player uses Z-targeting, the view shifts to a letterbox format and arrows indicate the targeted enemy. The player can then circle strafe around the enemy to keep their sight on them. Link collects items and weapons throughout the game, whose abilities allow him to access, navigate and complete dungeons to advance the story. Each dungeon is a dense, self-contained area in which Link solves puzzles and defeats enemies, and ends in a battle with the dungeon's boss, a powerful unique enemy. Each dungeon and its boss share a major item and common theme; for example Link must use the Fairy Bow to complete the Forest Temple and defeat its boss, Phantom Ganon, both of which involve trickery and misdirection. Defeat of a dungeon's boss grants Link a special item and advances the main quest. Link can travel between two points in time. Part way through the main quest, Link claims the Master Sword in the Temple of Time; when Link takes the sword, he is sealed for seven years, until he becomes an adult, and therefore strong enough to wield the Master Sword. Young Link and adult Link have different abilities, and are restricted to certain items and weapons. For example, only adult Link can use the Fairy Bow and only young Link can fit through certain small passages. After completing the Forest Temple, Link can travel freely between the two time periods by replacing or taking the sword. This can grant Link access to new areas: for example, the player can plant magic plants throughout the world, and return seven years later to find the plant full-grown and able to transport Link to secret places. Link is given the Fairy Ocarina near the beginning of the game, which is later replaced by the Ocarina of Time, given to him by Princess Zelda. Throughout the game, Link learns twelve melodies that allow him to solve various puzzles and teleport to previously visited locations in the game. :30 The melodies and notes are played using buttons on the Nintendo 64 controller. Ocarina of Time is set in the fictional kingdom of Hyrule, the setting of most The Legend of Zelda games, and takes place before all previously released games of the series. Hyrule Field serves as the central hub connected to several outlying areas with diverse topography and the races of Hyrule. :7–8 Subsequently released prequels to the game included Skyward Sword (2010), The Minish Cap (2004), and Four Swords (2002). At the Hyrule Castle garden, Link meets Princess Zelda, who believes Ganondorf, the Gerudo king, is seeking the Triforce, a holy relic that gives its holder godlike power. Zelda asks Link to obtain the three Spiritual Stones so he can enter the Sacred Realm and claim the Triforce before Ganondorf reaches it. Link collects the other two stones: the first from Darunia, leader of the Gorons, and the second from Ruto, princess of the Zoras. Link returns to Hyrule Castle, where he sees Ganondorf chase Zelda and her caretaker Impa on horseback, like in his nightmare, and unsuccessfully attempts to stop him. Inside the Temple of Time, he uses the Ocarina of Time, a gift from Zelda, and the Spiritual Stones to open the door to the Sacred Realm. There he finds the Master Sword, but as he pulls it from its pedestal, Ganondorf, having snuck into the Temple after Link, appears and claims the Triforce. Seven years later, an older Link awakens in the Sacred Realm and is met by Rauru, one of the seven sages who protects the entrance to the Sacred Realm. Rauru explains that Link's spirit was sealed for seven years until he was old enough to wield the Master Sword and defeat Ganondorf, who has now taken over Hyrule. The seven sages can imprison Ganondorf in the Sacred Realm, but five are unaware of their identities as sages. Link is returned to the Temple of Time, where he meets the mysterious Sheik, who guides him to free five temples from Ganondorf's control and allow each temple's sage to awaken. Link befriended all five sages as a child: his childhood friend Saria, the Sage of the Forest Temple; Darunia, the Sage of the Fire Temple; Ruto, the Sage of the Water Temple; Impa, the Sage of the Shadow Temple; and Nabooru, leader of the Gerudos in Ganondorf's absence, the Sage of the Spirit Temple. After the five sages awaken, Sheik reveals herself to be Zelda in disguise, and the seventh sage. She tells Link that Ganondorf's heart was unbalanced, causing the Triforce to split into three pieces. Ganondorf acquired only the Triforce of Power, while Zelda received the Triforce of Wisdom and Link the Triforce of Courage. Ganondorf appears and kidnaps Zelda, imprisoning her in his castle. The other six sages help Link infiltrate the stronghold; Link frees Zelda after defeating Ganondorf, who destroys the castle in an attempt to kill Link and Zelda. After they escape the collapsing castle, Ganondorf emerges from the rubble and transforms into a boar-like monster named Ganon using the Triforce of Power. Ganon knocks the Master Sword from Link's hand; with Zelda's aid, Link retrieves the Master Sword and defeats Ganon. The seven sages seal Ganondorf in the Dark Realm; still holding the Triforce of Power, he vows to take revenge on their descendants. Zelda uses the Ocarina of Time to send Link back to his childhood. Navi departs and young Link meets Zelda in the castle garden once more, where he retains knowledge of Hyrule's fate, starting with Hyrule's decline. 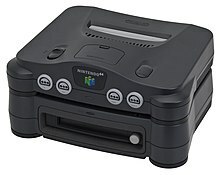 The Nintendo 64 with 64DD attached. First shown as a technical and thematic demonstration video at Nintendo's Shoshinkai trade show in December 1995, Ocarina of Time was developed concurrently with Super Mario 64 by Nintendo's Entertainment Analysis & Development (EAD) division. Nintendo planned to release Super Mario 64 as a launch game for the Nintendo 64 (N64) and later release Ocarina of Time for the 64DD, a disk drive peripheral for the system, which was still in development. Nintendo eventually migrated the development of Ocarina of Time from disk to cartridge media due to the high data performance requirements imposed by continuously reading 500 motion-captured character animations throughout gameplay. They planned to follow its release with a 64DD expansion disk. The 32-megabyte game was the largest game Nintendo had created at the time. Early in development, the team had concerns about the data storage constraints of the N64 cartridge; in the worst-case scenario, Ocarina of Time would follow a similar structure to Super Mario 64, with Link restricted to Ganondorf's castle as a central hub, using a portal system similar to the paintings that Mario uses to traverse the realm. An idea that arose from this stage of development, a battle with a doppelganger of Ganondorf that rides through paintings, was used as the boss of the Forest Temple dungeon. While Shigeru Miyamoto had been the principal director of Super Mario 64, he was now in charge of several directors as a producer and supervisor of Ocarina of Time. During its development, individual parts of Ocarina of Time were handled by multiple directors—a new strategy for Nintendo EAD. Four or five initial teams grew in number over time, each working on different basic experiments, including scenario and planning, Link's actions, transforming classic 2D items into improved 3D form, camera experiments, motion capture, sound, special effects, and the flow of time. The developers of Ocarina of Time were inspired by the Chanbara sword technique as seen in this photo. Although the development team was new to 3D games, assistant director Makoto Miyanaga recalled a "passion for creating something new and unprecedented". Miyamoto intended the game, a "medieval tale of sword and sorcery", to be in the chanbara genre of Japanese sword fighting. The development involved more than 120 people, including stunt performers used to capture the effects of sword fighting and Link's movement. Miyamoto initially intended Ocarina of Time to be played in a first-person perspective to enable players to take in the vast terrain of Hyrule Field better and let the team focus more on developing enemies and environments. The concept was abandoned once the idea of a child Link was introduced, and Miyamoto believed it necessary for Link to be visible on screen. Some of Miyamoto's ideas were instead used in Super Mario 64, since it was to be released first. Other ideas were not used due to time constraints. Ocarina of Time originally ran on the same engine as Super Mario 64, but was so heavily modified that Miyamoto considers the final products different engines. One major difference between the two is camera control; the player has a lot of control over the camera in Super Mario 64, but the camera in Ocarina of Time is largely controlled by the game AI. Miyamoto said the camera controls for Ocarina of Time are intended to reflect a focus on the game's world, whereas those of Super Mario 64 are centered on the character of Mario. We opted not to use that limited time and energy on pre-rendered images for use in cinema scenes, but rather on tests on other inter-active elements and polishing up the game ... Actually, I changed the scenario just a few months before completion, and although the staff was rather unhappy about taking apart something they had already created, we were able to make the fixes in a short amount of time, so that it did not cause any problems time-wise. It may sound like an excuse, but it is not because the N64 doesn't have access to a CD-ROM that we incorporated real-time movie processing. Quite the contrary, to the greatest extent possible we were able to make use of truly cinematic methods with our camera work without relying on the kind of data typically used to make cinema scenes. Miyamoto wanted to make a game that was cinematic, yet distinguished from films. Takumi Kawagoe, who creates cutscenes for Nintendo, said that his priority was to have the player feel in control of the action. To promote this instantaneous continuity of cinematic gameplay, the cutscenes in Ocarina of Time are completely generated with real-time computing on the Nintendo 64 and do not use prerendered full-motion video. Miyamoto's vision required this real-time architecture for the total of more than 90 minutes of cutscenes, regardless of whether the console had a vast medium like CD-ROM on which to store prerendered versions. Toru Osawa created the scenario for the game, based on a story idea by Miyamoto and Yoshiaki Koizumi. He was supported by A Link to the Past and Link's Awakening script writer Kensuke Tanabe. Miyamoto said the real-time rendering engine allowed his small team of 3 to 7 cinematic developers to rapidly adjust the storyline and to focus on developing additional gameplay elements even up to the final few months of development, instead of waiting on a repeated prerendering process. The dungeons were designed by Eiji Aonuma. Throughout the late 1990s, the Nintendo 64 was said to be critically lacking in first-party hit releases. Next Generation magazine stated that "Nintendo absolutely can't afford another holiday season without a real marquee title" and that Zelda was "one of the most anticipated games of the decade", upon which the Nintendo 64's fate depended. In March 1998, Ocarina of Time was the most anticipated Nintendo 64 game in Japan. Chairman Howard Lincoln insisted at E3 1998 that Zelda would be shipped on time and would become the company's reinvigorating blockbuster akin to a hit Hollywood movie. Customers in North America who pre-ordered the game received a limited edition box with a golden plastic card affixed, reading "Collector's Edition". This edition contained a gold-colored cartridge, a tradition for the Zelda series that began with the original game for the Nintendo Entertainment System. Demand was so great that Electronics Boutique stopped pre-selling the game on November 3, 1998. Several versions of Ocarina of Time were produced, with later revisions featuring minor changes such as glitch repairs, the recoloring of Ganondorf's blood from crimson to green, and the alteration of the music heard in the Fire Temple dungeon to remove a sample of an Islamic prayer chant. The sample was taken from a commercially available sound library, but the developers did not realize it contained Islamic references. Although popularly believed to have been changed due to public outcry, the chanting was in fact removed after the company discovered it violated their own policy to avoid religious material in games, and the altered versions of Ocarina of Time were made prior to the game's original release. Ocarina of Time's music was written by Koji Kondo, the composer in charge of music for most of the games in The Legend of Zelda series. In addition to characters having musical themes, areas of Hyrule are also associated with pieces of music. This has been called leitmotif in reverse—instead of music announcing an entering character, it now introduces a stationary environment as the player approaches. 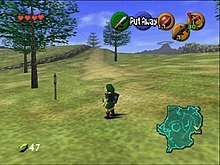 In some locations, the music is a variation of an ocarina tune the player learns, related to that area. Beyond providing a backdrop for the setting, music plays an integral role in gameplay. The button layout of the Nintendo 64 controller resembles the holes of the ocarinas in the game, and players must learn to play several songs to complete the game. All songs are played using the five notes available on an ocarina, although by bending pitches via the analog stick, players can play additional tones. Kondo said that creating distinct themes on the limited scale was a "major challenge", but feels that the end result is very natural. The popularity of Ocarina of Time led to an increase in ocarina sales. The official soundtrack of Ocarina of Time was published by Pony Canyon and released in Japan on December 18, 1998. It comprises one compact disc with 82 tracks. A U.S. version was also released, although with fewer tracks and different packaging artwork. Many critics praised the music in Ocarina of Time, although IGN was disappointed that the traditional Zelda overworld theme was not included. In 2001, three years after the initial release of Ocarina of Time, GameSpot labeled it as one of the top ten video game soundtracks. The soundtrack, at the time, was not released in Europe or Australia. In 2011, however, a 51-track limited edition soundtrack for the 3DS version was available in a free mail out through a Club Nintendo offer to owners of the 3DS edition, as an incentive to register the product. The original musical theme for the Fire Temple area was altered before release of the game, due to Nintendo's policy of not including real religious references in their products, with the altered theme simply removing the chanting samples. Hero of Time, an orchestral recording of Ocarina of Time's score performed by the Slovak National Symphony Orchestra, was released by video game label Materia Collective in 2017. A vinyl version was published by iam8bit. It was nominated for "Best Game Music Cover/Remix" at the 16th Annual Game Audio Network Guild Awards. Nintendo ported Ocarina of Time to its next console, the GameCube, as part of The Legend of Zelda: Collector's Edition, a compilation of Zelda games. The port runs at a resolution of 640×480, quadruple that of the original, and supports progressive scan. The compilation was included as a pre-order bonus with The Legend of Zelda: The Wind Waker (2002) in Japan and North America and included in GameCube bundles worldwide. It was also given to those who registered certain hardware and software or subscribed to official magazines and clubs. In February 2007, Ocarina of Time was released for the Wii Virtual Console service for 1000 Wii Points. This version is an emulation of the Nintendo 64 version; as controller vibration is unsupported, the "Stone of Agony" item, which employs vibrations via the Nintendo 64 Rumble Pak controller accessory, has no function. A five-minute demo of the game can be unlocked in Super Smash Bros. Brawl (2008). Ocarina of Time was rereleased on the Wii U Virtual Console worldwide on July 2, 2015, this time including the original controller vibration. Link swims in the Water Temple while wearing the Zora Tunic, which allows him to breathe underwater. In June 2011, Nintendo released Ocarina of Time 3D, an enhanced port for the Nintendo 3DS handheld console. It was developed by Nintendo EAD with Grezzo, an independent Japanese studio headed by Koichi Ishii. The game includes Master Quest and adds features including touchscreen and gyroscope controls, a "Boss Challenge" mode, instructional videos to guide stuck players, and modified version of the Water Temple with reduced difficulty. After completing Ocarina of Time, Nintendo developed a new version of the game for the then-unreleased 64DD peripheral with the working title Ura Zelda, commonly translated as "Another Zelda". Described as a second version of Ocarina with rearranged dungeons, it contains new content, some that had been cut from Ocarina due to time and storage constraints. In 1998, Ura Zelda was delayed indefinitely following problems with the development of the 64DD, and was canceled due to the 64DD's commercial failure. In August 2000, Miyamoto stated that Ura Zelda had been finished and that no online functions had ever been planned. Ura Zelda was ported to the GameCube in 2002 in Japan as Zeruda no Densetsu: Toki no Okarina GC Ura (ゼルダの伝説 時のオカリナ GC裏) and in 2003 in North America and Europe as The Legend of Zelda: Ocarina of Time Master Quest. According to Miyamoto, the Ura Zelda was simple to port as it used few of the 64DD features. Master Quest uses the same engine and plot of Ocarina of Time, but with increased difficulty and altered dungeons and puzzles. IGN's Peer Schneider gave Master Quest a mostly positive review, likening the concept to the second quest of the original Legend of Zelda. He felt that some redesigned areas were poorer than the original Ocarina of Time, and speculated that they may have been constructed from "second choice" designs created during development. He described the port as graphically improved, but contained no substantial improvement to the frame rate. He also expressed the controls translated to the GameCube controller felt clumsy. Nonetheless, he summarized Master Quest as a "sweet surprise for any Zelda fan" and wrote that he would have recommended it even at full price. Zachary Lewis of RPG Gamer praised the revised puzzles, which require precise timing and find new uses for the Ocarina items, but wrote that players would be enthralled or frustrated by the increased difficulty. Ocarina of Time was released to universal acclaim and strong commercial success worldwide. In the United States, over 500,000 preorders were placed, more than tripling the number of preorders for any previous video game, and more than 1 million copies were sold there in less than a week. In 1998, 2.5 million copies were sold, although it was released only 39 days before the end of the year; it earned $150 million in U.S. revenues, higher than any Hollywood film in the last six weeks of 1998. In Japan, 820,000 copies were sold in 1998, becoming the tenth best-selling game of that year; a reported 386,234 copies were sold in its first week there, surpassing the 316,000 first-week sales of Metal Gear Solid. In the United Kingdom, 61,232 copies were sold during its first weekend. During its lifetime, Ocarina of Time saw 1.14 million copies sold in Japan, and 7.6 million copies worldwide. On its initial Nintendo 64 release, Ocarina of Time received perfect review scores from the majority of gaming publications that reviewed it, including Famitsu, Edge, Electronic Gaming Monthly, GameSpot, and IGN. The review aggregator websites Metacritic and GameRankings respectively rank the original Nintendo 64 version as the highest and second highest reviewed game of all time, with average scores of 99/100 from Metacritic and 98% from GameRankings (it earned a 'Metacritic: Must-Play' certification on the former in 2018). The reviews praised multiple aspects of the game, particularly its level design, gameplay mechanics, sound, and cinematics. GameSpot reviewer Jeff Gerstmann wrote that Ocarina of Time is "a game that can't be called anything other than flawless", and IGN called it "the new benchmark for interactive entertainment" that could "shape the action RPG genre for years to come". Editors of GameTrailers called it a "walking patent office" due to the number of features it contains that became "industry standard". The graphics were praised for their depth and detail, although reviewers noted they were not always the best the console had to offer. Game Revolution noted the characters' faces, the "toughest graphical challenge on 3D characters", saying that the characters' expressions and animation featured "surprising grace". IGN believed that Ocarina of Time improved on the graphics of Super Mario 64, giving a larger sense of scale. Impressive draw distances and large boss characters were also mentioned as graphical highlights. Although excelling in the use of color and the visibility and detail of the environment, reviewers noted that some graphical elements of Ocarina of Time did not perform as well as Banjo-Kazooie, a game released for the same platform earlier that year. IGN said that the frame rate and textures of Ocarina of Time were not as good as those of Banjo-Kazooie, particularly in the marketplace of Hyrule Castle, which was called "blurry". Gameplay was generally praised as detailed, with many side quests to occupy players' time. IGN said players would be "amazed at the detail" of the environment and the "amount of thought that went into designing it". IGN praised the cinematics, citing great emotional impact and "flawless camera work". EGM enjoyed that Nintendo was able to take the elements of the older, 2D Zelda games and "translate it all into 3D flawlessly". Nintendo Power cited Ocarina of Time, along with Super Mario 64, as two games that "blazed trails" into the 3D era. The context-sensitive control system was seen as one of the strongest elements of the gameplay. Reviewers noted that it allowed for simpler control using fewer buttons, but that it occasionally caused the player to perform unintended actions. The camera control was quoted as making combat "second nature", although the new system took time for the player to get used to. The game's audio was generally well received, with IGN comparing some of Koji Kondo's pieces to the work of Philip Glass. Many atmospheric sounds and surround sound were designed to effectively immerse the player in the game world. Some reviewers complained that the audio samples used in the game sounded dated; others considered this a benefit, calling them "retro". Game Revolution called the sound "good for the Nintendo, but not great in the larger scheme of things" and noted that the cartridge format necessitated "MIDI tunes that range from fair to terrible". In 1998, Ocarina of Time won the Grand Prize in the Interactive Art division at the Japan Media Arts Festival. It also won six honors at the 2nd Annual Interactive Achievement Awards, including "Game of the Year", "Outstanding Achievement in Interactive Design", "Outstanding Achievement in Software Engineering", "Console Game of the Year", "Console Adventure Game of the Year" and "Console RPG of the Year". Electronic Gaming Monthly gave it both the editors' choice and readers' choice awards for "Game of the Year for All Systems", "Nintendo 64 Game of the Year" and "Action RPG of the Year" as well as the readers' choice awards for "Best Music" and "Best Graphics", and it was runner-up for the reader's choice "Best Sound Effects" award. Edge gave it the awards for "Game of the Year" and "Gameplay Innovation" and placed it 2nd place for "Graphical Achievement" (behind Virtua Fighter 3tb). After publication, Ocarina of Time was featured on a number of compiled lists of best or most influential games. It was ranked the greatest video game of all time by numerous publications including Computer and Video Games, Edge, Entertainment Weekly, GameTrailers, IGN, Metacritic, Next Generation, Nintendo Power, GameFAQs, GameStats, GamingBolt, VideoGamer [fr], Game Informer, Slant, FHM, Joystik, and PALGN. It also appeared on other lists of greatest games including those of Electronic Gaming Monthly and IGN. The game was placed second in Official Nintendo Magazine's "100 greatest Nintendo games of all time", behind only Super Mario Bros. Game Informer ranked it as its 11th favorite game of all time and described it as "untouchable". In May 2011, IGN held a tournament-style competition celebrating the 25th anniversary of the original The Legend of Zelda's release in which fans voted Ocarina of Time the greatest Zelda game; it beat Majora's Mask in the final round. Rockstar Games vice president of creativity Dan Houser stated in 2012, "Anyone who makes 3-D games who says they've not borrowed something from Mario or Zelda [on the Nintendo 64] is lying." Ocarina of Time has consistently been placed at number one in Edge's "top 100 games" lists: a staff-voted list in January 2000, a staff- and reader-voted list in July 2007, a list of "The 100 Best Games to Play Today" in March 2009, and a 2013 readers' poll selecting the 20 best games released since the magazine's launch in 1993. Edge concluded its 2009 list with, "Ocarina of Time is here in the list not because Nintendo had the power and wisdom to make a great game, but because it had the courage to make a unique one." Reception for the Master Quest and Virtual Console rereleases was positive; while some considered aspects of the graphics and audio to be outdated, most thought that the game has aged well. The Master Quest version holds an average score of 89.50% on GameRankings and 91/100 on Metacritic. IGN said in their review, "Ocarina of Time has aged extremely well", and noted in regard to the game's graphics, "While the textures and models look dated, the game's wonderful visual presentation stood the test of time." Game Revolution said that although the game has "noticeably aged compared to brand new RPGs ... it's still a terrific game", awarding 91 out of 100. Former GameSpot editor Jeff Gerstmann gave the Virtual Console port 8.9 out of 10, writing, "Even after nine years, Ocarina of Time holds up surprisingly well, offering a lengthy and often-amazing adventure". ^ Japanese: ゼルダの伝説 時のオカリナ, Hepburn: Zeruda no Densetsu: Toki no Okarina? ^ So named because it was executed by the Z button; Z-targeting is referred to as L-targeting in the GameCube rereleases and the 3DS remake. ^ In the GameCube port of Ocarina of Time and the Wii's Virtual Console version, targeting is done with the L button instead of the Z button due to the position of the Z button on the GameCube controller and Classic Controller. ^ "Game Design Essentials: 20 Open World Games". Gamasutra. September 26, 2007. Retrieved July 18, 2018. ^ a b c d e f The Legend of Zelda: Ocarina of Time instruction booklet (PDF). United States: Nintendo. 1998. U/NUS-NZLE-USA. ^ a b c d "The Essential 50 Part 40: The Legend of Zelda: Ocarina of Time". 1UP.com. Archived from the original on July 18, 2012. ^ The Legend of Zelda: Collector's Edition instruction booklet. USA: Nintendo. 2003. pp. 16–17. ^ The Legend of Zelda: Ocarina of Time/Master Quest instruction booklet. USA: Nintendo. 2003. pp. 14–15. ^ a b "HISTORY - ゼルダの伝説ポータル - Nintendo". Nintendo.co.jp. Retrieved November 21, 2018. ^ Nintendo Entertainment Analysis & Development (November 23, 1998). The Legend of Zelda: Ocarina of Time. Nintendo 64. Nintendo. ^ "Legend of Zelda". Next Generation. No. 14. Imagine Media. February 1996. p. 55. Well, the fact is that the videotape sequences shown at Shoshinkai bear very little resemblance to what the final product will actually look like. Spectacular scenes of a surprisingly large Link clad in polished armor are most likely to end up in cut-scenes rather than representing the actual play. ^ a b "Miyamoto Speaks". Nintendo Power. Vol. 89. October 1996. pp. 64–67. ^ Vestal, Andrew; O'Neill, Cliff; Shoemaker, Brad. "The Legend of Zelda: Ocarina of Time". History of Zelda. GameSpot. Archived from the original on February 4, 2013. ^ Iwawaki, Toshio; Aonuma, Eiji; Kawagoe, Takumi; Koizumi, Yoshiaki; Osawa, Toru. "Iwata Asks : The Legend of Zelda: Ocarina of Time 3D : What We Couldn't Do with The Legend of Zelda: Ocarina of Time" (Interview). Interviewed by Satoru Iwata. Nintendo. Archived from the original on July 25, 2015. Retrieved February 4, 2015. ^ "Zelda Officially Goes to Cart". IGN. March 7, 1997. Archived from the original on October 25, 2014. Retrieved April 23, 2008. ^ "Zelda 64 News: The biggest Cartridge Game Ever". IGN. August 21, 1997. Archived from the original on March 30, 2014. Retrieved October 23, 2007. ^ a b Walker, Matt (June 15, 2011). "Ocarina of Time Had Mario 64-Esque Paintings Early in Development". NintendoWorldReport.com. Archived from the original on June 20, 2011. Retrieved June 21, 2011. ^ a b c d e "Sensei Speaks". IGN. January 29, 1999. Archived from the original on August 20, 2013. Retrieved May 8, 2008. ^ "E3: Through the Eyes of Miyamoto Pt. 2". IGN. June 18, 1997. Archived from the original on October 22, 2013. Retrieved December 17, 2008. ^ a b c d e IGN Staff; Miyamoto, Shigeru (March 18, 1999). "GDC: Miyamoto Keynote Speech". Retrieved October 23, 2017. We opted not to use that limited time and energy on pre-rendered images for use in cinema scenes, but rather on tests on other inter-active elements and polishing up the game ... Actually, I changed the scenario just a few months before completion, and although the staff was rather unhappy about taking apart something they had already created, we were able to make the fixes in a short amount of time, so that it did not cause any problems time-wise. It may sound like an excuse, but it is not because the N64 doesn't have access to a CD-ROM that we incorporated real-time movie processing. Quite the contrary, to the greatest extent possible we were able to make use of truly cinematic methods with our camera work without relying on the kind of data typically used to make cinema scenes. ^ "Inside Zelda Part 12: The Role of the Sidekick". Nintendo Power. Vol. 203. May 2006. pp. 76–78. ^ Miyamoto, Shigeru. "Iwata Asks: The Legend of Zelda: Ocarina of Time 3D: Mr. Shigeru Miyamoto" (Interview). Interviewed by Satoru Iwata. Nintendo of America, Inc. Archived from the original on July 25, 2015. Retrieved February 4, 2015. ^ "The Legend of Miyamoto". Nintendo Power. Vol. 111. August 1998. pp. 52–55. Archived from the original on March 19, 2005. Retrieved April 26, 2014. ^ Mark Serrels (July 10, 2013). "Why Are You Here? Shigeru Miyamoto And The Ocarina Of Time". Kotaku Australia. Archived from the original on October 2, 2013. Retrieved October 11, 2013. ^ "Iwata Asks: Link's Crossbow Training". Nintendo of America, Inc. May 8, 2008. Archived from the original on July 25, 2015. Retrieved May 8, 2008. ^ "Interview with Shigeru Miyamoto". Nintendo Power. Nintendo of America. November 19, 1998. Archived from the original on June 19, 2004. Retrieved April 26, 2014. ^ "Inside Zelda Part 7: An Honest Perspective on Hyrule". Nintendo Power. Vol. 198. December 2005. pp. &70–72. ^ "Question and Answer Session with Mr. Miyamoto". Nintendo. Archived from the original on May 30, 1998. Retrieved May 30, 2010. Shigeru Miyamoto: However, the scenario and game modes are only about 50% my idea. ^ "Interview mit dem Meister". Club Nintendo (in German). No. Ausgabe 4. Nintendo of Europe GmbH. August 1998. p. 17. Shigeru Miyamoto: Die komplette Story ist von mir. / The entire story is from me. ^ Kohler, Chris (December 4, 2007). "Interview: Super Mario Galaxy Director On Sneaking Stories Past Miyamoto". Wired. Condé Nast Digital. Archived from the original on June 15, 2009. Retrieved June 10, 2010. ^ "Interview: Nintendo's Unsung Star". Edge. Future plc. February 6, 2008. Archived from the original on August 20, 2012. Retrieved July 11, 2010. ^ a b Nintendo Co., Ltd (November 23, 1998). The Legend of Zelda: Ocarina of Time. Nintendo of America, Inc. Scene: staff credits. ^ "クリエイターズファイル 第101回". Gpara.com. February 10, 2003. Archived from the original on September 30, 2011. Retrieved April 26, 2014. ^ "Iwata Asks : The Legend of Zelda: Spirit Tracks : The Previous Game Felt As Though We'd Given Our All". Nintendo. Archived from the original on July 25, 2015. Retrieved October 18, 2010. Eiji Aonuma: Our first 3D The Legend of Zelda game for the N64 turned out to be The Legend of Zelda: Ocarina of Time. I did some direction on that one, although it was only partial: I was in charge of dungeon design. ^ a b "Nintendo 64". Next Generation. No. 44. August 1998. pp. 40–41. Retrieved December 14, 2015. ^ "What Japan Wants". IGN. April 22, 1998. Retrieved April 1, 2018. ^ "Zelda's Future is Golden". IGN. August 26, 1998. Archived from the original on February 20, 2014. Retrieved September 24, 2007. ^ "Ye Snoozed, Ye Loozed". IGN. November 3, 1998. Archived from the original on October 25, 2014. Retrieved September 24, 2007. ^ a b c d e f Schneider, Peer (February 27, 2003). "Legend of Zelda: Ocarina of Time / Master Quest". IGN. Archived from the original on January 29, 2015. Retrieved February 1, 2015. ^ a b Dylan James (May 30, 2012). "Nintendo Officially Talks about the Infamous Ocarina of Time Fire Temple Chant". Zelda Informer. Archived from the original on February 12, 2013. Retrieved February 2, 2013. ^ Pop-Fiction Episode 9: Fire Temple Chants (Flash video). GameTrailers. February 22, 2011. Archived from the original on January 21, 2013. Retrieved April 27, 2011. ^ a b "Inside Zelda Part 4: Natural Rhythms of Hyrule". Nintendo Power. Vol. 195. September 2005. pp. 56–58. ^ a b Trueman, Doug. "Top Ten Video Game Soundtracks". GameSpot. p. 11. Archived from the original on January 25, 2013. ^ a b Whalen, Zach (November 2004). "Play Along — An Approach to Video Game Music". the international journal of computer game research. 4 (1). Archived from the original on October 3, 2006. Retrieved September 24, 2006. ^ a b c d e f g h i j k l m n o p Schneider, Peer (November 25, 1998). "Legend of Zelda: Ocarina of Time review". IGN. Archived from the original on October 9, 2012. Retrieved January 29, 2006. ^ King, Sharon R. (February 15, 1999). "Compressed Data; Can You Play 'Feelings' On the Ocarina?". The New York Times. Archived from the original on July 7, 2009. Retrieved August 25, 2009. ^ a b ゲームミュージック(パッケージ表記ナシ)「ゼルダの伝説・時のオカリナ」オリジナルサウンドトラック (in Japanese). Pony Canyon. Archived from the original on May 8, 2008. Retrieved April 17, 2013. ^ "Nintendo Officially Talks about the Infamous Ocarina of Time Fire Temple Chant". Zelda Informer. Archived from the original on November 23, 2016. Retrieved November 13, 2016. ^ Crecente, Brian (December 8, 2016). "The Legend of Zelda: Ocarina of Time soundtrack vinyl in the works". Polygon. Vox Media. Archived from the original on December 9, 2016. Retrieved December 8, 2016. ^ "The Legend of Zelda Collector's Edition". IGN. Archived from the original on September 29, 2012. Retrieved April 23, 2008. ^ "Zelda Bonus Disc Coming to US". IGN. December 4, 2002. Archived from the original on October 25, 2014. Retrieved September 24, 2007. ^ "Limited Edition Zelda in Europe". IGN. April 15, 2003. Archived from the original on October 25, 2014. Retrieved September 24, 2007. ^ "Zelda Bundle at $99". IGN. November 4, 2003. Archived from the original on July 13, 2013. Retrieved September 24, 2007. ^ Surette, Tim (February 24, 2007). "Ocarina of Time to blow on VC". GameSpot. Archived from the original on March 6, 2012. ^ a b Gerstmann, Jeff (March 5, 2007). "The Legend of Zelda: Ocarina of Time (Virtual Console) review". GameSpot. Archived from the original on October 15, 2007. Retrieved October 27, 2007. ^ Ronaghan, Neal (July 2, 2015). "This Week in the Nintendo Downloads". IGN. Ziff Davis. Archived from the original on July 3, 2015. Retrieved July 3, 2015. ^ Town, Jonathan (July 3, 2015). "The Legend of Zelda: Ocarina of Time (Wii U eShop / N64) Review". Nintendo Life. Gamer Network. Archived from the original on July 6, 2015. Retrieved July 26, 2015. ^ a b "Ocarina of Time 3DS Release Dates". N4G Network. Archived from the original on October 15, 2011. Retrieved October 18, 2011. ^ "Zelda Ocarina of Time 3DS Preview: Everything About This Masterpiece! - Best Nintendo 3DS Games". Best Nintendo 3DS Games. Archived from the original on October 28, 2014. Retrieved December 31, 2014. ^ "Master Quest Included In Oot3d, DS News – GamerZines: Free Digital Games Magazines". GamerZines. Archived from the original on November 2, 2014. Retrieved October 10, 2014. ^ "Boss Mode Coming to Ocarina of Time 3D – Nintendo 3DS News at IGN". IGN. Archived from the original on January 29, 2017. Retrieved October 10, 2014. ^ "Retrospective: The Legend Of Zelda: Ocarina Of Time". Edge. April 21, 2014. Archived from the original on April 23, 2014. Retrieved October 9, 2014. ^ a b c "IGN: GDC 2004: The History of Zelda". IGN. Archived from the original on February 13, 2015. Retrieved October 10, 2014. ^ IGN Staff (August 20, 1999). "Gaiden and Ura Zelda Split". Archived from the original on February 20, 2015. Retrieved February 1, 2015. ^ "Nintendo Sequel Rumblings". IGN. May 11, 1999. Archived from the original on February 20, 2015. Retrieved January 20, 2015. ^ a b "Zelda DD: The Other Adventure". IGN. November 17, 1998. Archived from the original on September 9, 1999. ^ "Info on Ura Zelda at Unseen64". Unseen 64: Beta, Cancelled & Unseen Videogames!. Archived from the original on May 27, 2013. Retrieved October 10, 2014. ^ a b c "IGN: Miyamoto and Aonuma on Zelda". IGN. Archived from the original on February 13, 2015. Retrieved October 10, 2014. ^ Miyamoto, Shigeru (August 28, 2000). "Miyamoto Roundtable: Game designer Shigeru Miyamoto talks to the press about Gamecube, N64 and GBA". IGN (Interview). Interviewed by IGN Staff. Archived from the original on August 12, 2016. Retrieved August 8, 2016. ^ Fahs, Travis; Thomas, Lucas (August 27, 2010). "IGN Presents the History of Zelda". IGN. Ziff Davis. p. 3. Archived from the original on February 24, 2014. Retrieved December 30, 2015. ^ a b c Lewis, Zachary. "Legend of Zelda: Ocarina of Time Master Quest - Review". RPGamer. Archived from the original on June 20, 2003. Retrieved October 2, 2008. ^ a b c "The Legend of Zelda: Ocarina of Time reviews". GameRankings. Archived from the original on March 6, 2009. Retrieved November 26, 2008. ^ a b "The Legend of Zelda: Ocarina of Time reviews". Metacritic. Archived from the original on November 21, 2010. Retrieved December 20, 2010. ^ Marriott, Scott Alan. "The Legend of Zelda: Ocarina of Time Review". AllGame. Archived from the original on November 14, 2014. Retrieved June 16, 2008. ^ a b "Legend of Zelda: Ocarina of Time review". Edge. Bath: Future plc. December 1998. pp. 84–87. ^ a b c d e Huber, Brooks. "Retro Review: Zelda Ocarina of Time". 1UP. Archived from the original on July 15, 2012. ^ a b "Zelda Receives Highest Ever Famitsu Score". IGN. November 13, 1998. Archived from the original on October 11, 2012. Retrieved April 13, 2008. ^ "Internet Archive Wayback Machine". gamepro.com. Archived from the original on July 5, 2008. ^ a b c Gerstmann, Jeff (November 23, 1998). "The Legend of Zelda: Ocarina of Time review". GameSpot. Archived from the original on October 15, 2013. Retrieved January 29, 2006. ^ "Now Playing". Nintendo Power. Vol. 114. November 1998. p. 122. ^ "Nintendo Power Vol. 114, p. 122". Archived from the original on July 24, 2013. Retrieved October 10, 2014. ^ "3rd CESA Awards". Japan Game Awards. 1998. Retrieved February 13, 2012. ^ a b "File:Edge UK 067.pdf - Retro CDN". retrocdn.net. ^ "1998 Gamers' Choice Awards". Electronic Gaming Monthly. No. 117. April 1999. pp. 107–114 . ^ "Previous Game of the Year Awards". Games. Archived from the original on February 9, 2012. Retrieved February 13, 2012. ^ "Overall Best Game of the Year". GameSpot. 1998. Archived from the original on May 8, 1999. Retrieved February 13, 2012. ^ a b "1999 2nd Annual Interactive Achievement Awards". Academy of Interactive Arts and Sciences. Archived from the original on October 23, 2010. Retrieved January 6, 2009. ^ a b "2nd Annual Japan Media Arts Festival". Japan Media Arts Plaza. Archived from the original on October 13, 2007. Retrieved September 20, 2007. ^ a b c "Zelda Sales Go (Deku) Nuts!". Computer and Video Games. No. 207. Emap. February 1999. p. 8. Archived from the original on April 4, 2016. ^ "Home Entertainment Awards – Video Games". Entertainment Merchants Association. Archived from the original on May 2, 2012. Retrieved February 5, 2012. ^ a b c d e f g h "The Best Video Games in the History of Humanity". Filibustercartoons.com. Archived from the original on September 21, 2010. Retrieved September 12, 2010. ^ a b c Mott, Tony, ed. (2007). Edge Presents The 100 Best Videogames. Future. p. 255. Reprinting material from Edge issue 80. ^ a b c Edge Staff (April 21, 2014). "Retrospective: The Legend Of Zelda: Ocarina Of Time". Edge. Future. Archived from the original on April 23, 2014. Retrieved June 1, 2014. ^ a b c Edge Staff (March 9, 2009). "The 100 Best Games to Play Today". Edge. Future. Archived from the original on March 26, 2012. Retrieved November 21, 2009. ^ a b c McFerran, Damien (October 24, 2013). "Readers Of EDGE Consider Ocarina Of Time And Mario 64 To Be The Best Games Of The Last 20 Years". Nintendo Life. Gamer Network. Archived from the original on January 29, 2017. Retrieved September 1, 2016. ^ a b c "Readers' Picks Top 100 Games: 1–10". IGN. 2006. Archived from the original on November 3, 2013. Retrieved April 26, 2014. ^ a b c "1. The Legend of Zelda: Ocarina of Time". Top 100 Games of All Time. IGN. 2008. Archived from the original on January 2, 2014. Retrieved April 26, 2014. ^ a b c d e "NP Top 200". Nintendo Power. Vol. 200. February 2006. p. 66. ^ a b "All Games By GameStats Score". GameStats. IGN. February 9, 2013. Archived from the original on February 9, 2013. ^ a b "Spring 2009: Best. Game. Ever". GameFAQs. Archived from the original on January 2, 2016. Retrieved December 13, 2014. ^ a b "Top 100 greatest video games ever made". Gamingbolt.com. GamingBolt. April 19, 2013. Archived from the original on October 26, 2014. Retrieved December 30, 2014. ^ a b "Top Games of All Time". VideoGamer.com. Archived from the original on August 15, 2011. Retrieved August 15, 2011. ^ Editors, Business. "Nintendo Promises More 'Zelda' on the Way; Retail Shortages of Video Game should be Rectified Soon." Business Wire: 1. November 27, 1998. ProQuest. Web. July 23, 2013. ^ "Zelda Breaks All Records". IGN. January 7, 1999. Archived from the original on May 9, 2014. Retrieved September 20, 2007. ^ "1998年テレビゲームソフト売り上げTOP100" (in Japanese). geimin. Archived from the original on May 7, 2009. Retrieved April 23, 2009. ^ "N64 saviour gathers momentum" (PDF). Edge. No. 67. United Kingdom: Future plc. January 1999. p. 11. ^ "販売本数ランキング" (in Japanese). ゲームランキング. Archived from the original on April 11, 2008. Retrieved May 28, 2009. ^ "GDC 2004: The History of Zelda". IGN. March 25, 2004. Archived from the original on November 16, 2013. Retrieved April 29, 2008. ^ "Top Ten Best and Worst Games of All Time". GameTrailers. November 17, 2006. Archived from the original on August 19, 2012. Retrieved January 19, 2009. ^ a b c Baldric. "Without a fairy, you're not even a real man". Game Revolution. Archived from the original on July 4, 2013. Retrieved April 9, 2008. ^ Nintendo Power 250th issue!. South San Francisco, California: Future US. 2010. p. 48. ^ "1998 Gamers' Choice Awards". Electronic Gaming Monthly. No. 117. April 1999. pp. 107–114. ^ EGM staff (2001). "Electronic Gaming Monthly's 100 Best Games of All Time". Archived from the original on June 20, 2003. Retrieved January 2, 2008. ^ "IGN's Top 100 Games of All Time". IGN. 2007. Archived from the original on August 25, 2013. Retrieved April 26, 2014. ^ East, Tom. "100 Best Nintendo Games — Part Six". Official Nintendo Magazine. Future plc. Archived from the original on October 30, 2014. ^ "Greatest Legend of Zelda Game Tournament - IGN". IGN. Archived from the original on July 27, 2013. ^ "The 100 Best Games to Play Today". Edge. Vol. 200. Future. April 2009. pp. 59–63. ^ "Nowadays, OoT is not that good". Destructoid. Archived from the original on January 27, 2010. Retrieved February 1, 2010. ^ "The Legend of Zelda: Ocarina of Time Master Quest reviews". GameRankings. Archived from the original on March 9, 2009. Retrieved March 4, 2008. ^ "search results". Metacritic. Archived from the original on December 19, 2010. Retrieved May 7, 2008. ^ Liu, Johnny (February 3, 2003). "The Legend of Zelda: Ocarina of Time Master Quest review". Game Revolution. Archived from the original on July 4, 2013. Retrieved October 27, 2007.